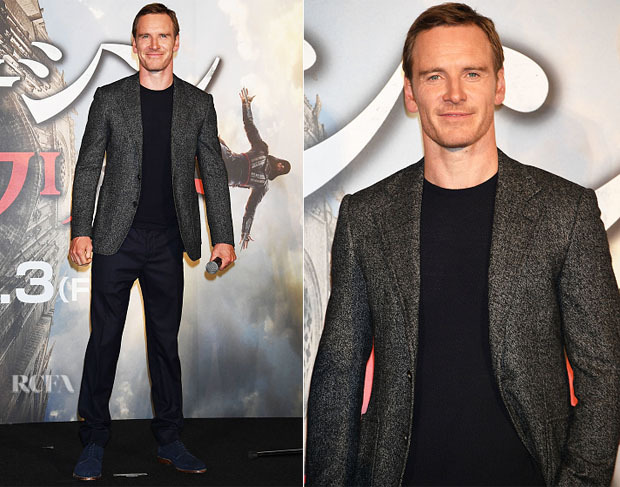 Michael Fassbender attended the stage greeting event for ‘Assassin’s Creed’ at Roppongi Hills on Wednesday (February 15) in Tokyo, Japan. While this was quite a relatively low-key event, his Canali jacket adds instant sophistication to this laidback, smart-casual look. I’m half tempted to say that Michael should’ve worn black shoes to add more balance to this look, but on the other hand the blue suede shoes a subtle flare and co-ordinate well with the navy chinos.